Houston, Texas is rich with culture, and the Houston Area Digital Archives division of the Houston Public Library works hard to capture the city’s history and make it accessible to all. In that spirit, HPL Cataloging and Metadata Services Librarian Jeanette Sewell recently submitted the digital archival coloring books designs she created. Instruction librarians are no strangers to explaining Boolean operators. The trick is to never mention the words “Boolean operators” to students, lest their eyes begin to glaze over and drool begin trickling from the corners of their slightly open jaws. So we try everything we can to make it entertaining, from sit down/stand up exercises (e.g. “everyone wearing blue jeans AND glasses stay standing”) to amazingly hilarious images like the one above, created by Erica DeFrain from the Bailey/Howe Library at the University of Vermont. I’m actually married to a graphic designer…but I think (I hope) the ugliness contributes to the humor of the whole thing. Talking about Boolean search logic can be a little challenging, especially in late-afternoon classes. I wanted to give a nod to a cultural phenomenon while also perhaps getting a laugh from those in the audience who know and love the infamous honey badger. For the layered Pixlr file, email Erica DeFrain. Often we create a single design to promote a library event, but every now and then an event is so important that it deserves an entire marketing campaign. This was the case for Maryland Day. Each year our university hosts Maryland Day, an annual open house for the community, prospective students, and current students, faculty, and staff. The event is a chance for academic departments, campus offices, and local community organizations to connect with visitors. 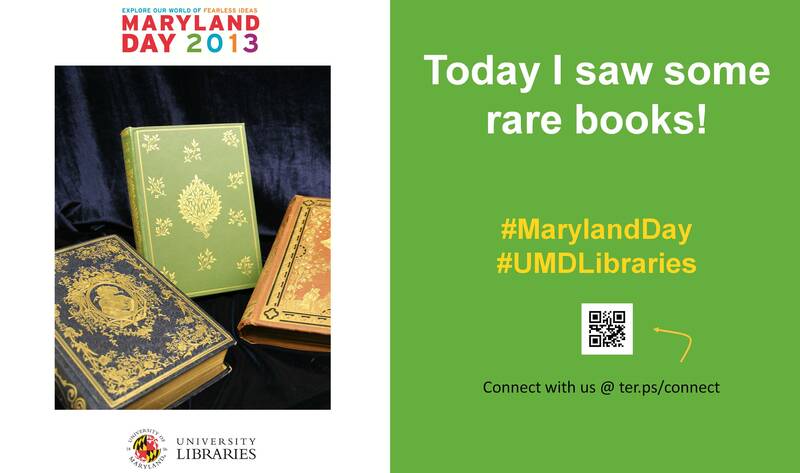 The UMD Libraries ran several events, most of which were held in Hornbake Library and McKeldin Library. 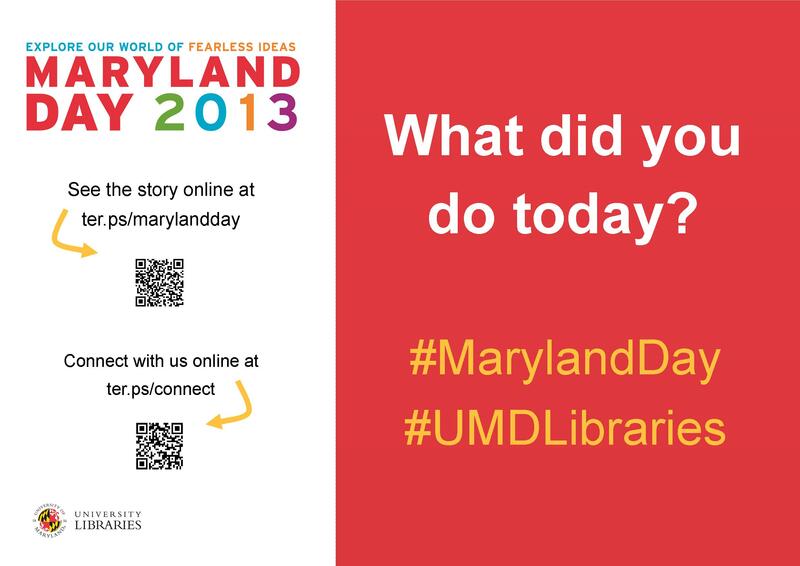 Our team created promotional materials to advertise the UMD Libraries’ events and our “What did you do today?” social media campaign, including posters, a library website ad, TV monitor slides, and postcards for people to take with them or mail to a friend or family member. We wanted to keep the design fun, simple, and colorful, so we used our official university colors (red, yellow, black, and white) as well as Maryland Day colors (bright red, green, blue, orange, and purple). 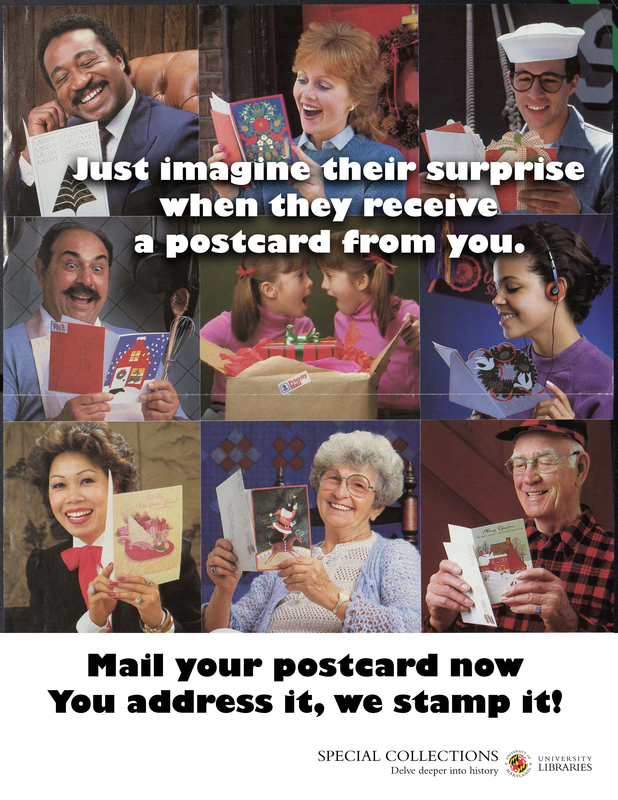 For the postcards and slides we took original photos of our activities, and we used images from our digital collections to advertise the fact that we would stamp and mail postcards for people who wanted to send them to friends and family members. With each design, we tried to keep the amount of information to a minimum and emphasize the sharing/online component. Wow, right? Everything UMD has done here is awesome, but I especially enjoyed the social media aspect, because you can see how much the community enjoyed the event! Rebecca and her colleagues, Laura Cleary, Special Collections Coordinator and Instruction & Outreach Team Leader, and Sarah Espinosa, Graduate Student Assistant and Instruction & Outreach Team Member, used a variety of programs to best suit their creative needs. For the original files of any of the designs, contact Laura Cleary.